Creative Diagnostics offers custom hybridoma optimization service. Our scientists have special experience in this field. Although hybridomas are theoretically immortal and produce antibodies indefinitely, there are several limitations in antibody production using hybridomas. 3. Hybridomas diminish the antibodies production levels. We are experts in solving these problems through hybridoma optimization such as Re-Cloning and Re-Fusion. This way you recover the best existing clone in terms of stability and productivity. Re-Cloning: If your hybridoma has diminished in levels of antibody production, or the monoclonality is in question, Creative Diagnostics will subclone hybridomas and establish new monoclonal cell lines selected for maximum antibody productivity. 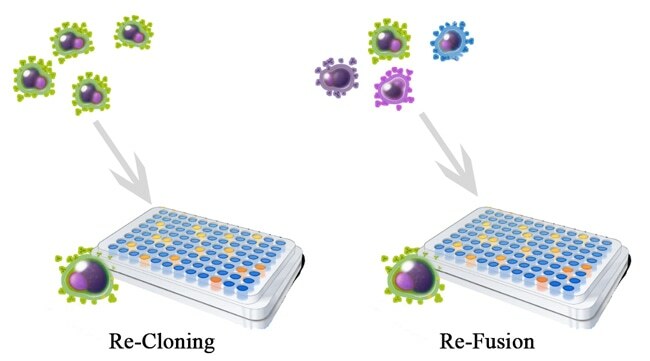 Re-Fusion: If your hybridoma has diminished in levels of antibody production, or no longer grows well, Creative Diagnostics will re-fuse hybridomas to at least two different myeloma cell lines and establish new monoclonal cell lines for you. We will make our best effort to optimize the hybridomas you request and ensure the secreted antibodies remaining the same. If you have any demand in this service, just inform us and in most cases we can accommodate your request.